This trendy white jersey gown features a slightly fluted skirt and side cut outs adorned with cobalt blue stones. Open at the lower back. Rent this fun dress for a prom, pageant or engagement party. 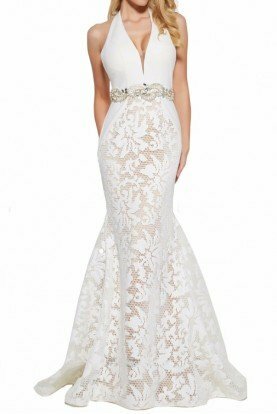 Rachel Allan style 7070. According to customer reviews, this dress fits true to size with some stretch. Length: Approximately 58 inches with a train in the back. If you have questions about the fit, text our fit specialist directly at 773-243 - 9433 for instant answers 8 AM - 9 PM CST.